Wind has been giving me the "no flight blues" past couple days as well, I got one fpv flight in on Sunday, and ever since it has been to windy to fly (I don't have any flying wings ready to fly at the moment, might have to build a quick one so I can fly in all this wind). Just looked at the weather forecast, high winds for the next week 😒, it also said there was 90% chance of a flying wing build tomorrow, oh wait, I said that 😄. Good luck on that maiden whenever it happens, hope it goes well for you 🙂. At least you pushed to do it and that is good enough for me. Now that you have the TT ready I know you are just waiting for the prefect time to go fly. Like I said yesterday don’t push to fly when it’s not the best possible conditions to do so or when you feel things don’t work. I don’t go flying in winds stronger than 14km/hr and also then I go less calm. Why? Cause I know what I feel comfortable with and with what I have a chance to go home with a plane instead of pieces of a plane. Absolutely glorious! Another member of the family who understands my type of humor! Everybody gets the humor, you and I actually think it is funny. I also wish you the best of luck, both on your build and the flight of the Wing. I was going to question, but instead I took a few moments to visualize why one would want a Wing in high winds. It came to me. A hawk in flight. They were the only birds out today. Because they can handle the strong wind. They ride it. In the Phoenix sim, I have had no luck with flying wings. Such large lifting and control surfaces, it just goes nuts. I'm guessing you are thinking of a large wing build, so it has some mass, and big batts and motor, so it can soar in the wind. I guess I'm going to question after all. The wind was blowing hard enough to move my car. It was gusting from every which way. I stood and watched a flag for a bit. All over the darn place, and completely extended. Just not a good day to fly. The day doesn't have to be perfect. I would like it to be survivable. That’s what I meant. There is no need to fly when things are not right. I don’t go flying when it’s to windy makes it super hard to control the plane. I might eventually give it a try when I feel good enough at flying different models. Or when my mini arrow is ready which will be in about an hour from now . Or when my mini arrow is ready which will be in about an hour from now . What!!?? Rock on, my friend. Rock on! Wanted to finish it off last night but my wife wanted to go to sleep and after a few nights of which we don’t get to go to sleep together I preferred to go to bed with her and get up fresh to finish it off . The arrow itself is really only missing the electronics. Wings are better windy day flyers because they have a lower side profile for the wind to catch. Actually, I’m going to build quite the opposite, a 20-24 inch span, 1106 (TINY), and a 800 2s, a wing small and probably heavy for its size. I’m hoping for a very small, easily portable fpv platform that will perform well in winds to high to fly anything in the same size range that isn’t a wing. @buzzbomb here is the finished mini arrow for you. 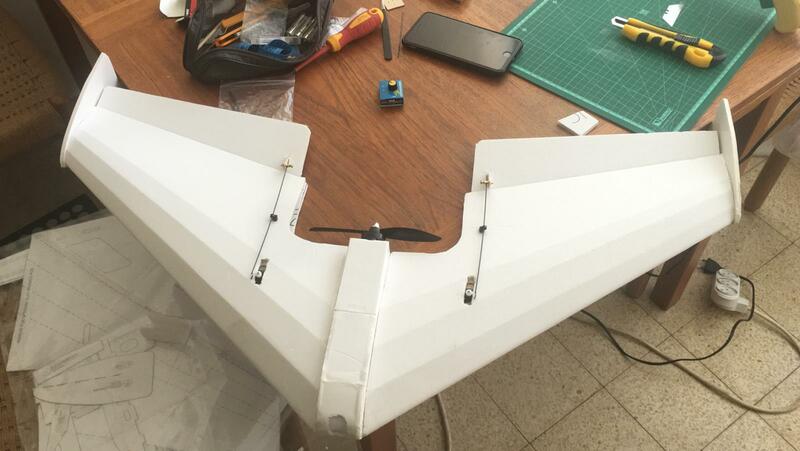 I am kinda afraid of it cause it’s the first time I’ll be flying a wing and it has the f pack setup (stronger motor). Pretty much the same power as on mine - its a really good match, a bit less than half throttle for easy level flight. I launched on about 70% and it flew away nicely with no big torque roll. You should be fine! A wing responds just like a conventional airplane BUT it does everything snappier! Just be gentle on the controls and Launch it at about half throttle or a little higher. gain some height first and then throw it around the sky at full throttle and you will soon see why people love them! Set your ailerons to 40% throw, 50% expo for the initial flight, I found mine really sensitive. Everything else by the instructions. Yeah, yeah, tell me about it! Soon though, soon! Now we're just waiting on decent flying weather to correspond to one of my days off. Then she's in the air! Then the ground. Awesome! I wish you all the luck. Thankfully you've been racking up the experience. It looks like a solid build to my untrained eyes, mayan. Just keep in mind the advice you gave me (physician heal thyself) and whatever happens... it'll be thrilling! @buzzbomb can I tell you a secret? I left the kids home today to go flying with them ... Does that make me bad or crazy?! Who cares I am going to have fun with the kids . Moments only happen once. Trust me on this. Embrace the moments with your children because they'll be moving on before you know it. You are neither bad nor crazy, just wise. Enjoy the time with them. So long as you are not doing anything that will make them fail in school and therefore life, get crazy and enjoy the memories you are making. From a South Carolina redneck to my friend in Israel? Ya'll have fun!